The reason behind this is because during the last 2 weeks I’ve been working very hard on a project that I have done for the Mornington Football Club in their 125th anniversary year. I’ve produced and directed a 30 minute documentary on the history of the club which I am selling for $20. The trailer to the full doco can be found here and on Youtube. Please check it out if you have the time. The story behind the making of this video can be found at The Footy Almanac. My season playing for Mornington might be over, but the AFL is just heating up. With two rounds left to go, practically every individual award has been wrapped up. Ablett with the Brownlow, Kennedy with the Coleman, Wines with the Rising Star and Mitchell with the Norm Smith (note to self, come back and edit this in 2 weeks time). But one question that hasn’t yet been asked (ever) is what is the most successful jumper number of 2013? That is a very valid question. After much data collection (I can see why no-one has asked this before), number 9 and number 3 were consistently the best performers (in terms of disposals) in each of the 18 AFL teams in 2013. You just can’t go wrong with number 9. 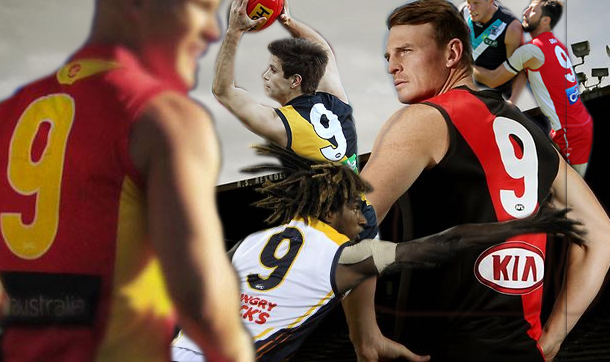 Ablett, Goddard, Cotchin, Sloane, Gray, Malceski and Naitinui and Scully (LOL!) all share the number 9 jumper. A few surprises jumped up after the results came in. Typically you would expect lower numbers to be given to the better performers in the team. Number 26 proved this wrong. With Hawkins, Giles, Douglas and Dal Santo they proved to be a competitor this year, coming in 6th place. League leader for disposals, Dane Swan, on 635, did well to push the number 36 jumper up, but still finished in 41st place, as only 8 other players shared that number in 2013. As far as low numbers preforming badly, 15, 13 and 2 were further down the list than you would expect in 24th, 21st and 18th place respectively. 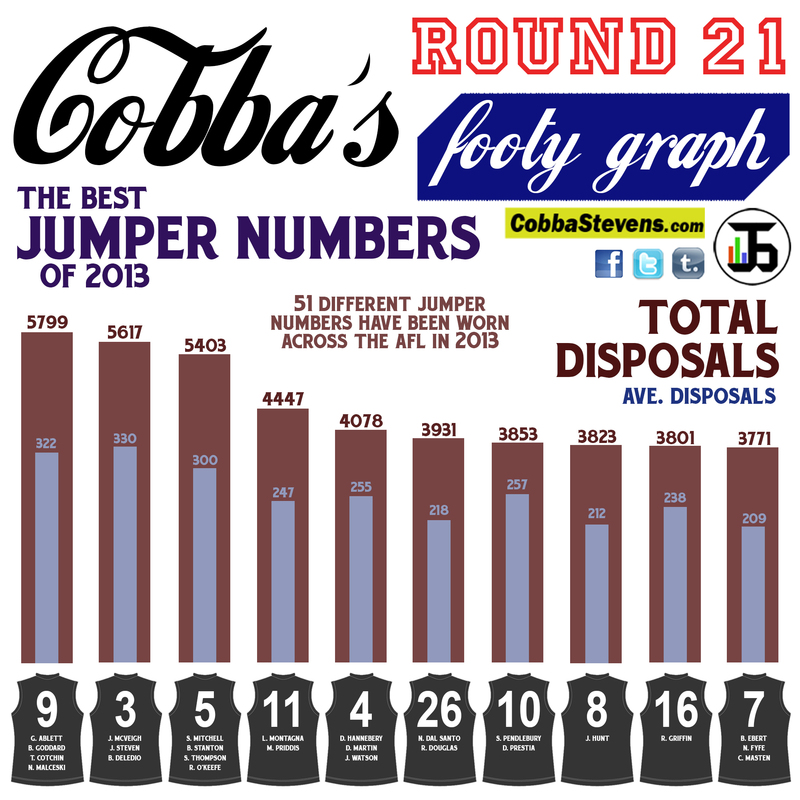 As far as the poorest (overall) performing number went this year, was 49, worn only 5 times in 2013 by the Bulldog’s Ayce Cordy, amassing a total of 40 disposals. ← Cobba’s Third Ashes Test Graph – D.R.Mess!